Here is another recipe we enjoyed camping last weekend. Our mint is abundant right now and there are only so many mint cocktails one can drink. 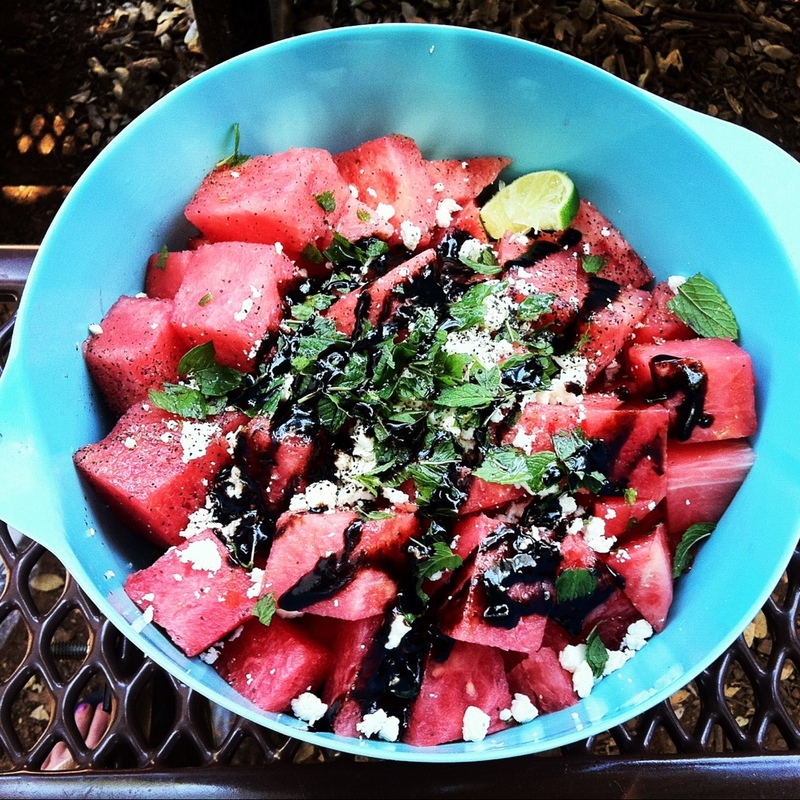 I thought this simple little salad would be refreshing camping and easy to throw together. This salad is great with figs, too. This year a little birdie we call Baby eats our figs as fast as they come off the tree. She has even full on shoplifted a fig! We were in Whole Foods and she was sitting in the cart. I turned my back for a second to pick out a peach and when I looked she had grabbed a fig out of a basket on the display and had started eating it! Baby also got into a shopping bag today, found an avocado and bit into it as though it were an apple. Anyway, she loved this salad. It is a great way to showcase fruit at it’s peak. For babies, watermelon is a great first solid once they are ready to try venturing past purées since it is so easy to “bite into” with just gums. I don’t have measurements for this salad, so just eyeball it. Cut up the watermelon and chill, if it isn’t already cold. Then add the rest of the ingredients, mix and serve immediately. This entry was posted in Family Adventures, Food, Healthy Recipes, Homemade Baby Food, Recipes for the Whole Family, Recipes from the Garden, Urban Homesteading and tagged baby and me dishes, baby led weaning, easy farm to table, easy seasonal recipes, farm to table, meals for the whole family, natural baby food, vegetarian. Bookmark the permalink.